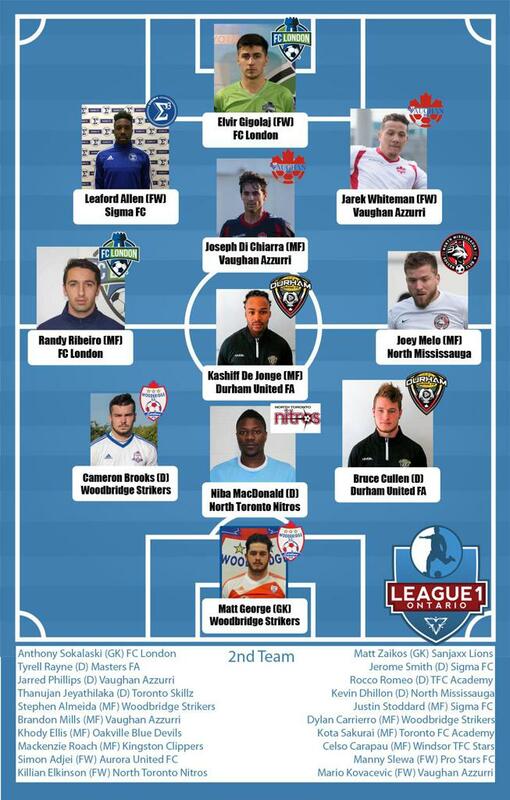 In the first of a set of daily League1 Ontario 2016 Awards announcements leading up to the L1O Awards banquet on Sunday November 27, the 2016 Men's First and Second Team All-Stars have been revealed, featuring outstanding performers from the 2016 season. The first team, laid out in a 3-4-3 formation, features 2016 Golden Boot winner Elvir Gigolaj (FC London) as well as Jarek Whiteman (Vaughan Azzurri) and Leaford Allen (Sigma FC) to complete a formidable attacking trio. The midfield four features Randy Ribeiro (FC London), Kashiff De Jonge (Durham United FA), Joey Melo (North Mississauga Panthers) and League1 men's final MVP, Joseph Di Chiara (Vaughan Azzurri). The defensive line finds Niba Macdonald (North Toronto Nitros) matched up with Cameron Brooks (Woodbridge Strikers) and Bruce Cullen (Durham United FA) in front of keeper Matt George (Woodbridge Strikers).